First- this hat is definitely sized for larger heads. I'll include a couple tips at the end for people with smaller heads or a lot less hair than TG. Originally, I had planned on just a plain ear flap hat with big pompoms, but after it was done, TG said "It should have kitty ears." This did take 2 hours to make start to finish for me using bulky yarn and a big hook. dec sc= decrease single crochet- insert hook in first stitch, pull up loop, leave on hook, insert hook in next stitch, pull up loop, yarn over, pull through all 3 loops on hook. Round 1: With the great big size Q hook, chain 2 OR do a magic ring. Work 6 sc in first ch or in magic ring. Slip stitch to join. Rounds 8-11: Ch 1, sc in each st around, sl st to join. Count 6 stitches from back seam, and join in yarn using Q hook. Row 6: rsc or sc in each stitch. This makes the back of the hat 10 stitches between flaps, the flaps at 6 stitches wide, and the space in front is 8 stitches. 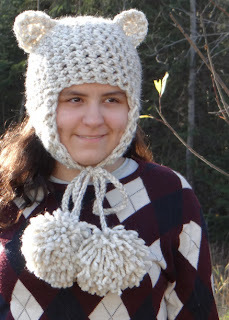 With Q hook, join yarn at back seam, and single crochet in each stitch around until the bottom of the ear flap. *Switch to L hook, and sc in first sc on the bottom of the flap, ch 40, sl st back up ch, sc in next st on the bottom of the of the flap,* switch back to Q hook, and single crochet in each stitch until you reach the tip of the other ear flap, repeat **, switch to Q hook, and sc in each stitch back to the first st, sl to join. Round 1: With the great big size Q hook, chain 2 OR do a magic ring. Work 5 sc in first ch or in magic ring. Ch 1 to turn. Round 2: 2 sc in first sc, sc in next sc, 3 sc in next sc, sc in next sc, 2 sc in last sc. Break off yarn leaving a tail to stitch ears to hat. Stitch to hat. I centered them over the ear flaps and stitched them starting from the 3rd round on the hat. Cut a length of yarn about 10 inches long, lay it across cardboard lengthwise. Wrap yarn 140 times around the cardboard and the piece of yarn. Cut off and slide yarn carefully off the cardboard. Tie the 10 inch pieces tight around the yarn loops, and knot securely. Cut open loops and trim to make it round leaving the tie ends alone. Sew the pom poms to the end of the ties and knot securely. To make it smaller- I don't recommend a smaller hook size because there is so much difference in the bigger sizes. Instead, for much smaller sizes, don't do the increase to 30 stitches, and do 5 rounds of 24 stitches instead. For just a little smaller heads, instead of starting with 6 stitches, start with 5 stitches. My daughter loves the hat, and the big pom pom ends! This is so cute. I will have to make it for sure thank you.